Social media marketing is increasingly becoming my primary method for promoting my company. I am active on a few social media networks and have been for a few years now. However, I consider myself to be an advanced newbie so I’m always on the lookout for new resources (books, blogs, etc.) that offer tips and advice. A few months back I heard about Shama Hyder Kabani’s book: “The Zen of Social Media Marketing” (2010) and decided to check it out. 1. The book covers the basic fundamentals of social media so newer users can get off to a good start while violating as few etiquette rules as possible. 2. Just about every chapter of the book follows a pattern of theory > explanations of features > best practices > brief examples > recap. By the time I finished a chapter, I would have a better understanding of the topic that was discussed and at least a few basic ideas for how I could utilize what I learned. 3. I think I learned at least one thing from each chapter of the book. However, I learned and got the most ideas from the chapter about video. The information about the reality of video sharing websites really drove home the point of using your website as the home base/central hub for all online marketing efforts. I had previously read about and experimented with video podcasting but the book offered some great new insights for how videos could be used to increase a website’s audience and improve search engine rankings. 1. Given that the internet and social media change very quickly, some of the audience sizes, features, etc. provided were outdated. However, that’s not the fault of the author. Any book that discusses the internet or social media would contain at least a bit of outdated content within a year or two of printing. 2. The book cover states that there are continuous online updates and within the book there is mention of a companion workbook that’s available online but I couldn’t find them. However, its possible that they were available at some point but were later removed. 3. I agree with the recommendation of using a program to simultaneously update the status of all of your social media profiles (Ping.fm is specifically recommended but I use Hootsuite). However, the book included commentary from a business owner who recommended registering for all of the available social networks on Ping.fm and I completely disagree with that idea. It’s one thing to claim usernames to prevent others from using those names and leaving the profile dormant/private but if you start updating the profiles you should be prepared to interact with the people who might contact you. Following the provided example, what was intended to be a time saver could turn into an enormous time drain. 4. Its been argued that email marketing (while old school for the internet) is still one of the most effective online social marketing tools so its a bit disappointing that its mentioned but not covered in any detail. 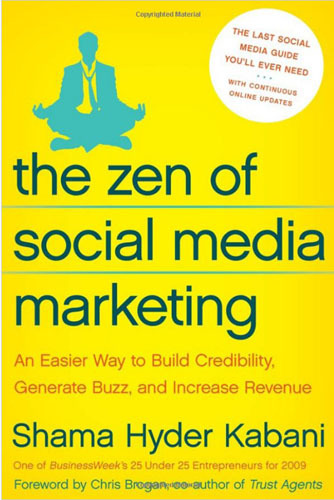 The Zen of Social Media Marketing is a great book for anyone who uses social media to market and promote their business. I would especially recommend this book for small business owners who don’t have a lot of time or the marketing budgets of large companies. This review is based on the 2010 edition of the book. A new edition (“The Zen of Social Media Marketing”  ) was recently released featuring updated content, expanded chapters, and coverage of a few new social networks. While the basics are still valid, I’d suggest that you skip the 2010 version and getting the 2012 edition instead. I plan to read at least the chapters about the specific networks in the 2012 edition at a later date and will update this post at that time. Natasha – thank you for the review! I’d be more than happy to send you the 2012 version. Please drop me an email.